Edgartown, Martha’s Vineyard – Some generations of Corvette, like the C6, were designed after certain aircraft, such as the F22 Raptor. However, one thing is for sure – a Corvette was never meant to fly in mid-air! 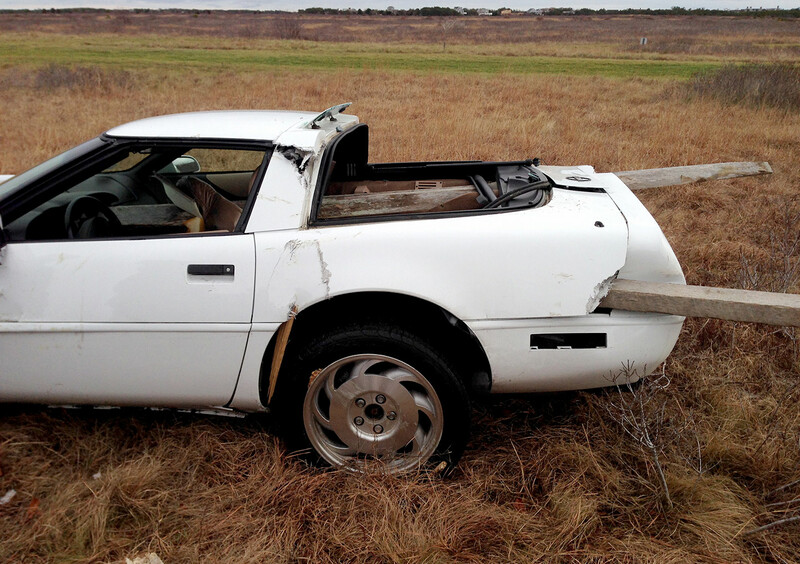 According to The Martha’s Vineyard Times, Edgartown police and emergency personnel were called to the Katama airfield on Sunday morning, December 21st, where a smashed-up 1996 Corvette was found with fence posts impaled through the car in different directions. Apparently, the driver of the Corvette plowed through a fence and left the scene of the accident. While the car sustained heavy damage, there were no signs of blood or other bodily injury in the car. After conducting a thorough search, the police were able to locate the 74-year old owner and driver of the car at his home. He admitted to authorities that he had been racing up and down the road in his Corvette, lost control of it through a fence, and walked home to call a tow truck. We have a feeling, the police were less than amused! next Some Say Beauty is in the Eye of the Beholder?